Film Review: ‘The Disaster Artist’! By now you must know about the “The Room.” If by some chance you don’t know what it is, I would highly recommend viewing before watching “The Disaster Artist,” although it is by no means required. Just as a cliff’s note, “The Room” is a cult film known as the best worst movie ever made. It’s a melodramatic poorly acted mess, but it has hit a chord with enough people to gain midnight movie status, along with audience participation a-la Rocky Horror Picture Show. It is a beast all of its own and it has drawn the love from college stoners to A list actors alike. Naturally, in the center of the Venn Diagram of these fanbases, lies James Franco. 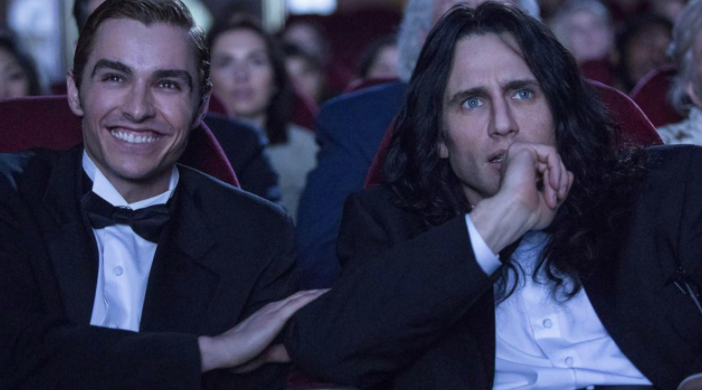 So it is of little surprise that James Franco wants to pay homage to this amazing spectacle, a feat he bravely tackles and succeeds with “The Disaster Artist.” Technically, the film is based on the book by co-star of “The Room,” Greg Sestero. The book (which is a total must read) is a tell all of the story behind the film, as well as an intimate look at the friendship between Sestero and the mastermind himself, Mr. Tommy Wiseau. Wiseau is a character unlike any other. A mystery of a man, an outcast, completely socially inept, and sometimes just all-around a-hole, but somewhere beneath all that is a lot of heart; this is evident to those that ultimately get to know him. The film does a wonderful job of bringing life to the story behind the film. To the fanboy, it tells a story we all know and adore. To the uninitiated, it is a film about friendship, determination, and love of cinema. Real life brothers James and Dave Franco (James under heavy makeup) recreate the dynamic duo of Wiseau and Sestero. The movie works so well in many regards due to the natural chemistry of James and Dave. They emulate love, disdain, jealousy, and joy that only comes with an honest bond. The journey of a couple of nobodies to misfit movie stars is truly a fantastic ride to join. 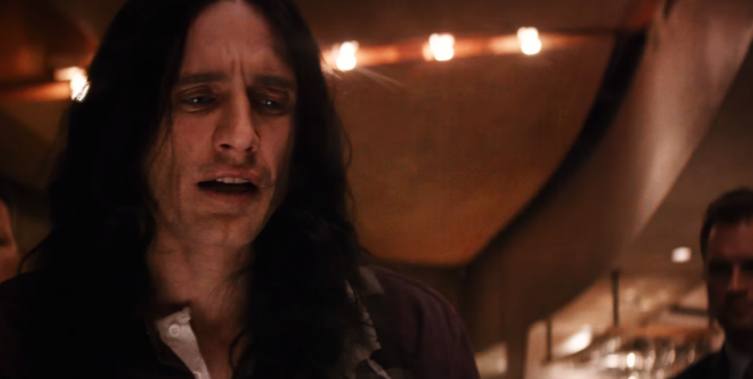 Although “The Disaster Artist” doesn’t quite capture the magic of “The Room,” it is a fantastic piece. Please watch this film, buy The Room, read the book, go to midnight movies, and come live the joy of this unprecedented phenomenon. Don’t be a chicken…cheep cheep cheep! Oh hi Mark. New Trailer for The Disaster Artist is here! Check Out The Trailer For ‘Disaster Artist’ From James Franco!!! Dan Moran’s Holiday Movie Guide! This entry was posted on Thursday, November 16th, 2017 at 11:56 am	and is filed under Film, News. You can follow any responses to this entry through the RSS 2.0 feed. You can skip to the end and leave a response. Pinging is currently not allowed. « Film Review: ‘The Room’!